Parents see you as a trusted partner in their child’s care, and they look to you for information about how their child is developing. Using good listening skills can make your conversations with parents easier and help you feel more confident. Celebrating milestones is infectious! Families begin to see the importance of those accomplishments and will want to take notice as well. Children grow up so quickly; it is as if one day they are beginning to sit up and the next they are playing baseball. All the “small” steps in between represent important developmental milestones: rolling over, sitting up, crawling, cruising, walking, running, and others. 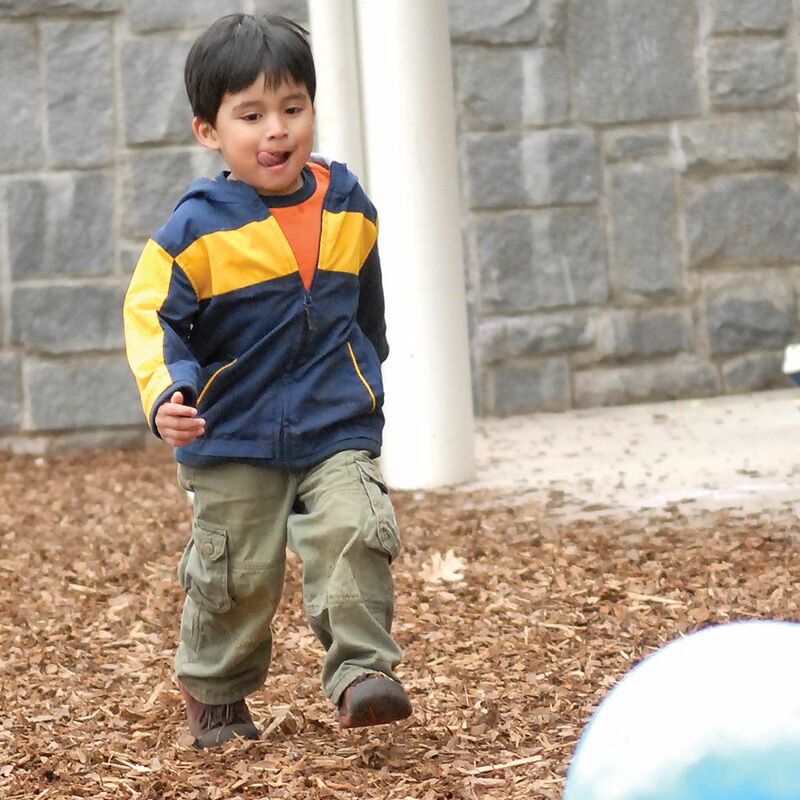 Just like these movement milestones that are so familiar to parents, their child’s social/emotional, communication/language, and cognitive developmental milestones also progress in a series of orderly steps. In addition, there can be clues in those steps that could alert parents to a potential developmental concern. 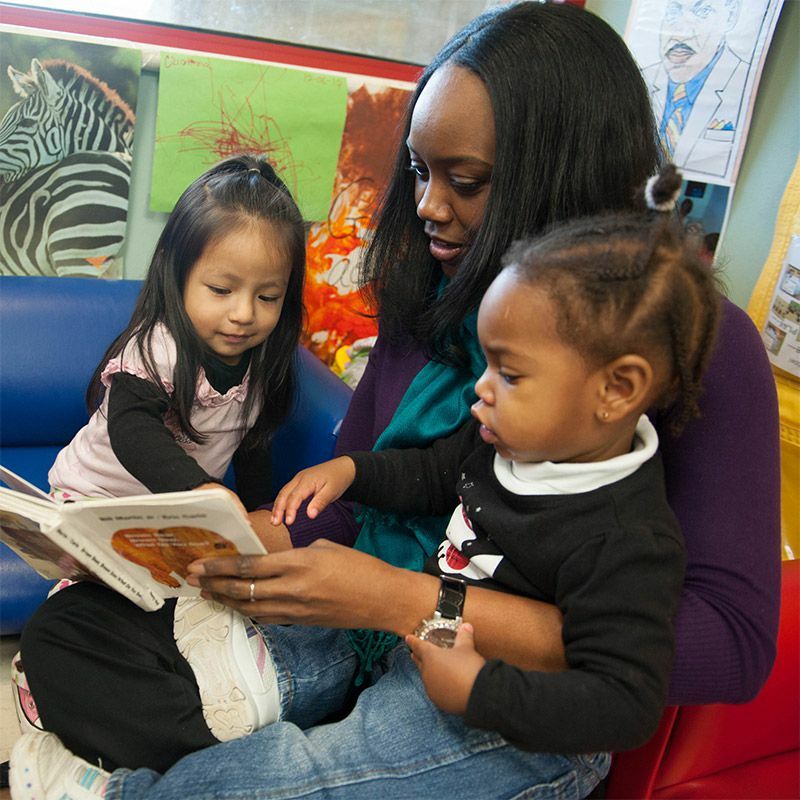 The more you, as their trusted partner and provider, routinely talk with families about their children’s development, the more families will be engaged as well. *Parents refers to the primary caregivers of children in your care. Sharing milestones with parents can help them have realistic expectations and better understand their child’s behaviors. If parents do not know when a child should have a certain skill, they may worry unnecessarily. If a parent says she is concerned that her 2-month-old is not rolling over, you can reassure her that rolling over from tummy to back is a typical milestone at 4 months. When a child reaches milestones early or late, it’s important to share that information with parents. Parents always like to hear if their child has met a milestone early. Although it’s not as fun to share information about late milestones, it’s important to give parents that information as well. Because acting early can make such a difference, sharing milestones with parents and pointing out areas of concern can also help them recognize potential developmental concerns. When you talk with families, be mindful of cultural differences. Not all cultures place the same emphasis on particular developmental milestones. When communicating with families, be aware of your own cultural biases in making decisions about how to communicate with families. Good listening skills help make a conversation more successful. During the conversation, listen closely; try to make eye contact, nod when appropriate, and be silent when the parent is speaking. Developing and using these listening skills in your conversations with parents will help to enhance your relationships with parents and make difficult conversations more successful. Encourage families to use developmental milestone checklists to monitor their child’s development. Milestone checklists and the Milestone Moments booklet from CDC’s “Learn the Signs. Act Early.” program are easy-to-use, proven tools as useful for families as they are for you. 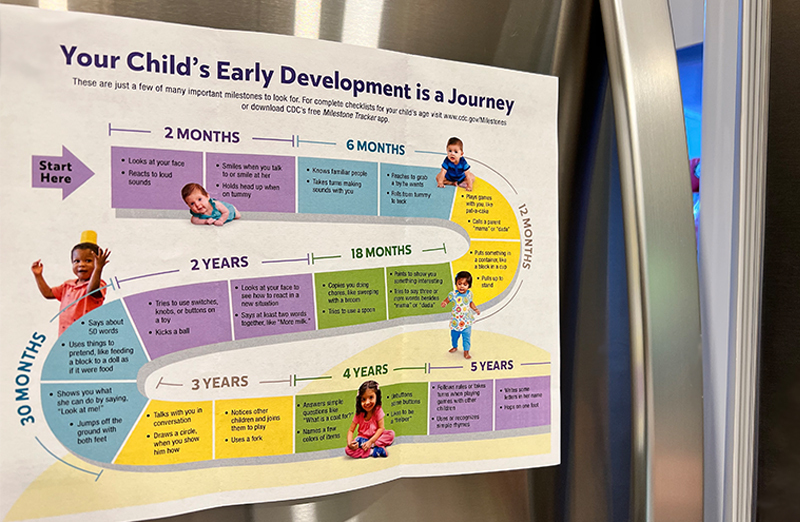 These materials can help families understand what typical developmental milestones are at certain ages and can help establish appropriate expectations. Not only will these materials give parents a snapshot of what their child is doing right now, they will help them to anticipate developmental milestones that are emerging or will come next. Having milestone checklists as a reference can greatly help you and the parent think about what kinds of toys might be appropriate and how to create an environment that encourages the child's development. If you build developmental monitoring and feedback into your daily routines, such as in progress reports, for example, then families will begin to notice what their child is accomplishing and might begin monitoring their child’s developmental milestones at home. Having frequent conversations about development with families when they drop off or pick up their child can show the parent that you value their child and his or her development. Parents will love to hear that their child used a play phone to “call” them at work as much as how long he napped. Communicating concerns with families about their child’s development will be much easier if you have already established a meaningful relationship, are prepared, and focus your conversation on specific developmental milestones. Beforehand, invest considerable time in building meaningful and collaborative relationships with the parents. Chances are, parents may already have some concerns of their own and might feel more comfortable having that conversation if they feel they have a relationship with you that is built on mutual respect and open communication. 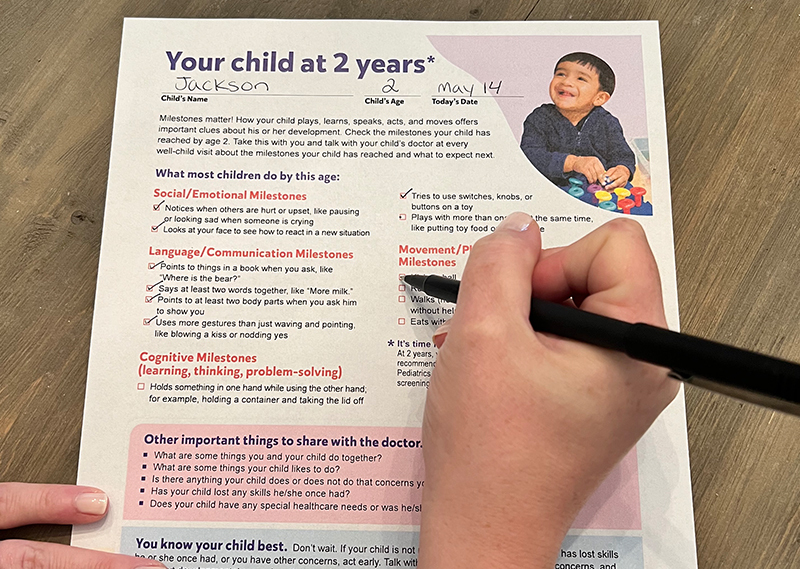 Complete a milestone checklist for the child’s age, either as a single sheet or in the Milestone Moments booklet (find both here). If the child is between ages of the milestone checklists, use the checklist for the younger age. Prepare for the conversation by reviewing some helpful tips for talking with parents about developmental concerns. Make sure you know your center's policies. Be aware of your employer’s policies regarding conversations with families. Your center’s policy may only allow the director or other administrator to communicate developmental concerns to families. Be aware of your center’s referral procedures and community contacts, so that you are prepared with that information if you need to give it to families. Let your supervisor know you plan to have this conversation with a parent(s) and consider asking for him or her to join you for the conversation. Now that you have been observing and monitoring, you have a lot of knowledge and insight about children in your care. You will want to communicate this information in the best way possible. Use the completed milestone checklist as the basis for your conversation. The checklist is an objective tool that can both confirm and pinpoint your concerns. And because it was developed by CDC and is based on the gold-standard milestone lists from the American Academy of Pediatrics, it offers you enhanced credibility and objectivity in your conversation. I think Jason is behind in his development. He can’t do things other children can do at his age. I wanted to take a minute to talk with you about how well Jason is developing. I like to use a checklist for developmental milestones from CDC and the American Academy of Pediatrics. It’s good for helping us understand his development and which milestones he’s met, along with which ones he’s still working on. Start off the conversation by highlighting some of the child’s strengths. Name some developmental milestones the child has mastered, and say how excited you are to see his or her progress in those areas. Jason doesn’t know what to do with a toy phone or even a spoon, and there are other milestones he hasn’t met either. This list shows all the milestones he can’t do. 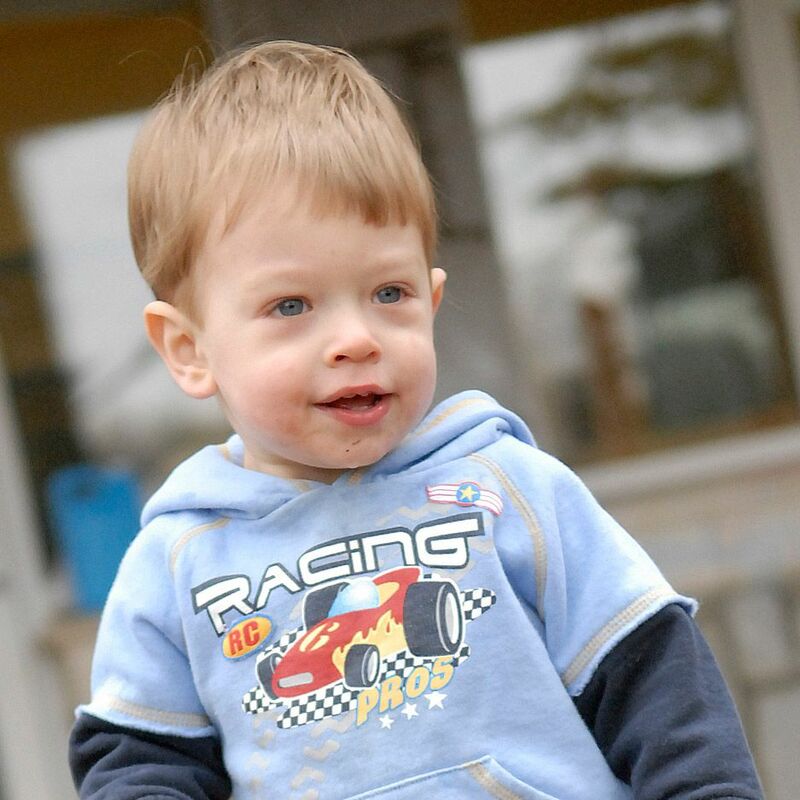 Jason has made some real progress in his developmental milestones lately. I noticed he really likes to play alongside other children, and he is good at following simple instructions. There are other milestones he’s met, and some he’s still working on. Let’s take a look at this list, and you can fill me in on whether you’ve seen some of these at home, too. Focus on specific developmental milestones in your conversation, without including any diagnostic labels. Even if you believe you can identify a specific disability in a child, it is never your role to make a diagnosis. I saw a special on TV last week about autism and I am pretty sure that’s what Jason has. Does Jason turn and look at you when you call his name? I have noticed that he does not seem to respond to his name but continues to play with a truck, spinning the wheels around and around. Be clear about what your goal is for the conversation. Be honest, kind, and respectful in your tone. It is okay to say you may be overly concerned, and that it is always best to check with the child’s doctor. Look at all these milestones Jason is missing on this checklist. That means that something is really wrong with his development. He’s way behind the other kids in this room. This checklist can help us better understand Jason’s development, and that’s what we’re trying to do. But even if he is missing some of these milestones, that doesn’t necessarily mean anything is wrong. It’s always a good idea to pay attention to his development and to talk about it when you take him to the doctor. I’ll give you a copy of this milestone checklist so you can take it with you and talk about it with his doctor the next time you go. Make the conversation a two-way discussion. Pause a lot, giving the parent time to think and respond – Remember your active listening skills! Listen to and watch the parent to decide on how to proceed. Pay attention to tone of voice and body language. So that’s the list. Take it to the doctor and see what he has to say about it. That’s what I wanted to cover today. Have you seen Jason do some of these milestones at home? PAUSE. Now that we’ve looked at the checklist, what are your thoughts? PAUSE. What do you think is a good idea to do next? PAUSE. Remind the parent that you care for their child and you want to make sure that the child has every opportunity to be his or her very best. Jason is challenging; he’s just not like the other kids. But I’m doing what I can with him. I really love Jason and I am so happy to have him in my class. I want what’s best for him, and that’s why I wanted to talk to you about this. If we do have a concern, it’s best to address it right away. We can talk about this again in a month or so, and maybe by then you can let me know what the doctor’s thoughts were. It is important to remember that when raising concerns with families, in some ways you are asking them to reconsider their image of their child and potentially their dreams and vision for their future. Some families may be relieved because they had had the same concerns themselves but were afraid to raise them. Others may resent or deny your concerns and refuse to accept the information you give them. Whatever the parent’s response, if you have the facts based on an objective measure, then you can encourage the families to take that information to their child’s healthcare provider. Parents rely on their child’s healthcare provider for advice and information about their child. Whether they and their child have been seeing the same doctor for years or see a different one every visit, parents can enhance their relationship with their child’s doctor by having conversations routinely about their child’s development. Encourage parents to share their concerns with their child’s doctor or healthcare provider. Many families have a regular pediatrician or healthcare provider who can help the family sort out their concerns and think about next steps. The American Academy of Pediatrics recommends that all children be screened using a formal, scientifically tested screening tool whenever there is a concern, along with routine screenings at 9, 18, and 24 or 30 months and autism screening at 18 and 24 months. Encourage families to ask their child’s doctor about developmental screening especially if a milestone checklist pinpoints a concern. If you or someone in your center regularly screens children in your care with a formal, scientifically tested screening tool, encourage the family to share those screening results with their child’s doctor. If the family does not have a regular healthcare provider, then you may want to talk with your center director or employer about helping connect a family to a medical home. You can help them find one at the National Center for Medical Home Implementation website. 1. Remind parents that their questions and concerns are important and that sharing them with the child’s doctor is an important step to getting their child the early help he or she might need. 2. Print a copy of the tip sheet Concerned about development? How to talk with the doctor. and give it to the parent. what parents can do if they feel uneasy about the advice the doctor has given them. 3. Later, follow-up with the parents to find out how the visit with the doctor went. 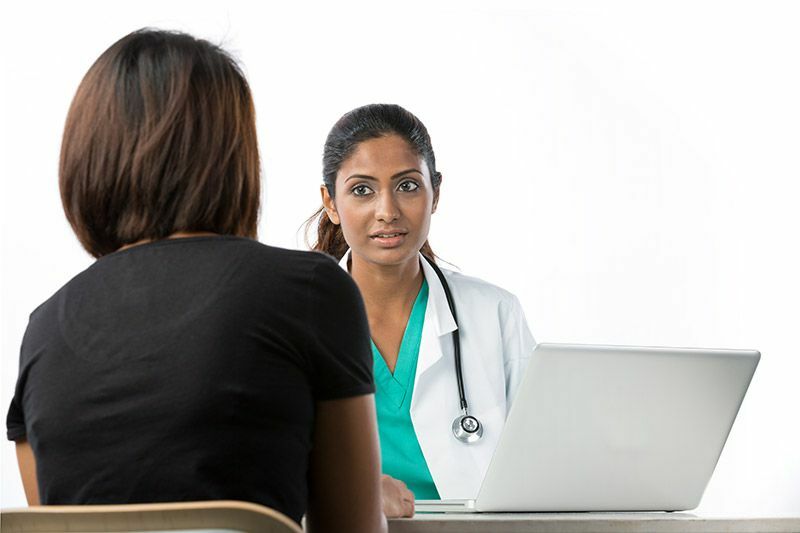 If the parent is not satisfied with how the visit went or is feeling uneasy about what the doctor said, encourage the parent to consider getting a second opinion. Remember, providing support to parents to help them “act early” on developmental concerns may take a little extra effort, but can make a world of difference for the child and the whole family! Are you concerned about the development of a child in your care? Have you talked with his or her parent(s) about your concerns? If you have, think about that conversation in light of what you’ve learned in this module. What did you say to the parent? How did you say it? Did you encourage the parent to talk to the child’s doctor? Did you suggest the parent call the early intervention program? What would you have done differently now, after this training? If you have not talked with the parent, think about how you might have that conversation. How do you need to prepare? What resources will you gather to provide to the parent(s)? Who else at your center will you include in the conversation? What suggestions will you give the parent(s)? Use the information in this module to help you.